Travka is a Romanian alternative rock band, its last line-up consisting of George Gâdei (vocals), Alexei Turcan (guitar, accordion, samples), Misha Gâlcă (guitar), Sorin Erhan (bass) and Cristi Chirodea (drums). Founded in spring 2002 in the city of Focşani, Romania, the band quickly rises to fame in underground circles. 2003 is the year when Travka steps into spotlight, having various TV appearances and playing in front of thousands of people at music festivals such as Top T - Buzău and Stufstock. 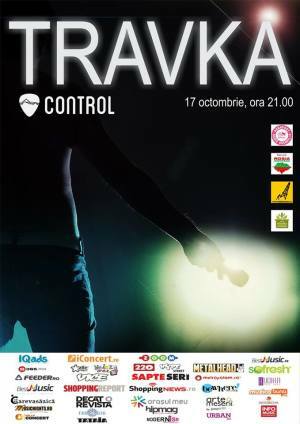 "TRAVKA - Live @ Control" Concert in Bucharest. You can get here description, reviews, address, time and details of "TRAVKA - Live @ Control" Concert in Bucharest. Visit Bucharest Tips for more Concert events in Bucharest!